No more paper. Stop using spreadsheets. Stop wasting time. Stop worrying about breaches and fines. 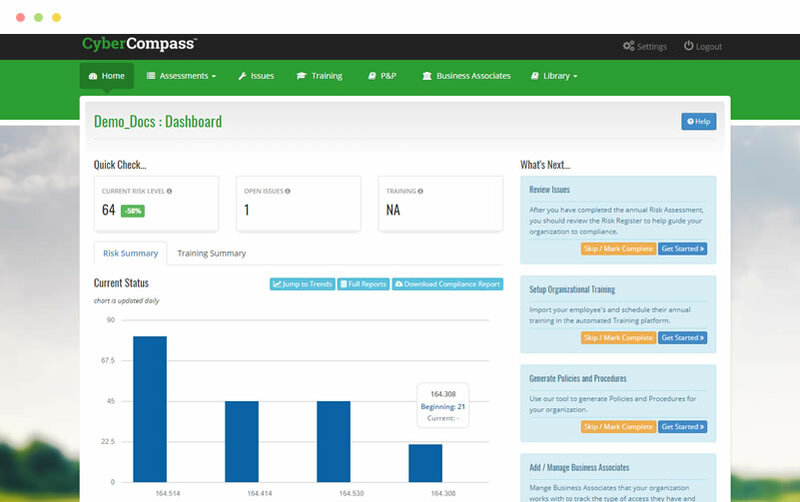 CyberCompass™ is a next generation integrated software platform. Everything you need to navigate your organization to CyberConfidence™. CyberCompass™ guides you through the assessment and the remediation of all identified issues, saving you over 65% in time. Simple. Complete. Confident. Most companies do not use any integrated software to manage cyber risk and compliance. CyberCompass™ is an affordable “best in class” solution enabling pre-breach protection and compliance in as little as 90 days for your organization. CyberCompass™ is used by Texas Medical Liability Trust and and endorsed by Texas Health Services Authority. Get started by picking the Self-Assessment plan that fits your organization! myeMED Management is a Practice Management Company dedicated to helping our physician‐clients realize more profits, improved customer care and a better work/life balance from their practices. Our team of experienced experts are passionate about creating medical practices that are bigger, better, and stronger than ever imagined. We accomplish this pursuit through ensuring that physicians achieve a work-life balance, experience less stress in managing their practices, employ efficient and satisfied employees, cut costs, compliance and increase revenue and opportunities through a loyal and satisfied patient base.